As a promotion for the upcoming eighth and final season of Game Of Thrones, HBO launched a worldwide scavenger hunt in which fans are tasked with finding six life-sized Iron Thrones hidden in various undisclosed locations. At the time of writing this article, four of the six thrones have been found with just over seven days remaining to find the final two. Who will lay claim to these very expensive pieces of litter? Will it be you? Or will it be some unsuspecting child who maims themselves on this very sharp television prop? 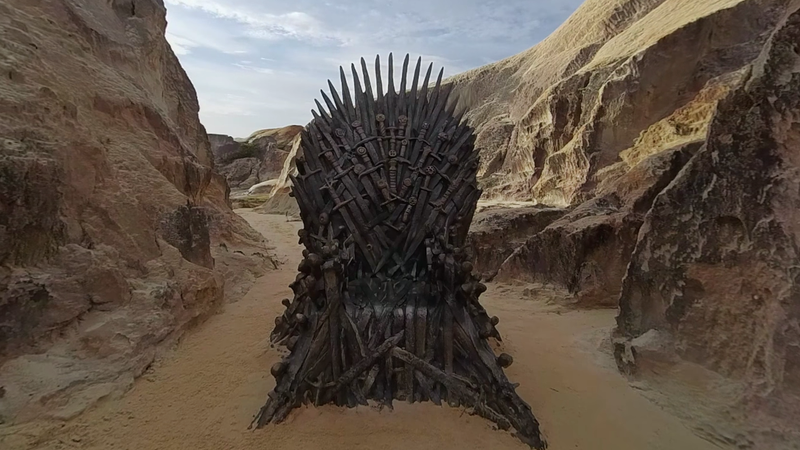 Using context clues from the 360-degree video HBO provided, fans discovered the first throne in the forests of the United Kingdom. Next came the Throne of the North in snowy Sweden, followed by the Throne of Valyria in Brasil and the Throne of Joy in Spain. The fifth, undiscovered throne has been dubbed the Throne of Ice and is, you guessed it, somewhere very icy. It looks like it’s at the base of a frozen waterfall to be exact. Considering none of the previous thrones have been located in North America, we’re willing to bet this one is somewhere in one of the colder, northern states, or perhaps even in Canada. The video of the sixth and final throne won’t be revealed until someone finds the Throne of Ice, so get hunting. It’s only a matter of time before some punk teenagers find these things and tip them over, drawing the wrath of HBO’s legal stooges.